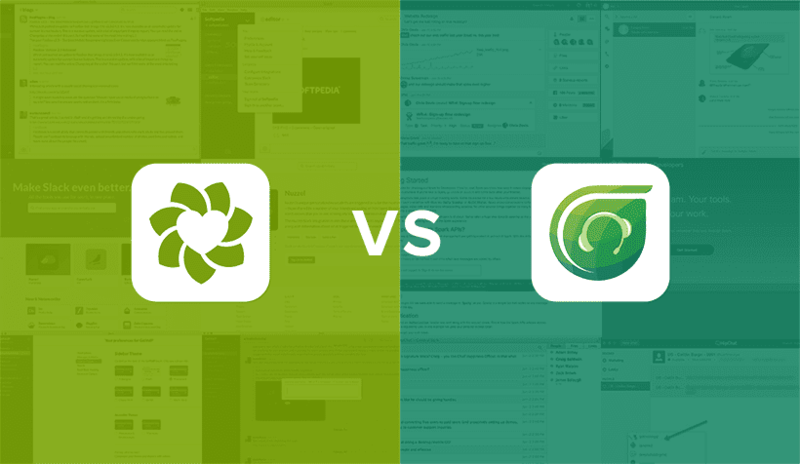 Zendesk and Freshdesk are both helpdesk CRM platforms with similar features. Zendesk, which was founded in 2007 in Copenhagen, Denmark, sought to upend the customer service industry by focusing both on the customer and agent experience. In 2011, Freshdesk was launched in Chennai, India, as a means to provide a range of comparable features at accommodating price points. Though initially criticized as an imitation of Zendesk, Freshdesk has grown in subsequent years and the two helpdesk CRMs are now often rated and compared as equals. Zendesk and Freshdesk offer comparable features and deciding what works best for your company often requires research and hands-on experience. We’ve done that for you to give you a nuanced head-to-head comparison of these two potent platforms, packed with everything including the features essential to email marketing. Zendesk’s out of the box UI is a clean layout with a crisp lines and a color scheme that’s easy on the eyes. There’s a left vertical toolbar which icons which identify through hovertext (Home, Views, Reporting, Admin) and which open up dashboards with large icons for different functions. The Home dashboard shows the channels you use for engaging customers, like email, phone, chat, and social; the self-service library of your knowledge base, community forums and web widges; your apps, ticketing workflows, reporting and so forth. 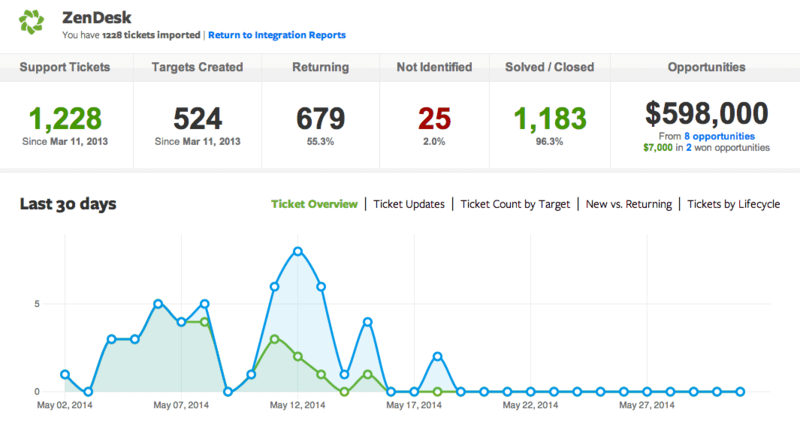 The Views dashboard gives you an in-depth view of the status of all your tickets. This page provides an overview for a support agent’s immediate concerns. You can view unsolved tickets assigned to you, or unassigned; recently updated tickets, new tickets in your groups, suspended tickets deleted tickets, etc. The Reporting dashboard provides a gloss over view of your ticket statuses, your helpdesk performance against industry averages, agents’ support performances as a whole and individually, and top agents by tickets solved, satisfaction and agent ‘touches’. The Insights section provides more in-depth analysis based on company data. The Freshdesk UI positions a horizontal header toolbar with terms, instead of icons, granting access to different dashboards. Its main dashboard view provides a ticket summary of unresolved, overdue, open, on hold, and unassigned tickets, as well as tickets due today. There is an activity feed reminiscent of social media news feeds. On the right of the header toolbar there is a quick add button for emails and tickets, as well as a search function. The Tickets dashboard provides a perspective on tickets which can be filtered on a number of criteria, such as the ticket status, the creation date, due date, priority, type, source, customers or by tags. Ticket data can be exported as an Excel or CSV file. The Reports dashboard provides three categories of reports – Helpdesk Analysis, Productivity and Customer Happiness. Subsections within each category offer reports such as ticket volume trends, agent performance, group performance, top customer analysis and more. The Helpdesk In-depth subsection (part of the Analysis category) offers charts based on specific ticket metrics, like ticket status, average first response time, average resolution time, the percentage of tickets that were resolved after the first contact, and so forth. Most reports can be filtered by time period, agent, group, customer type, source, priority, and product. Verdict: Personally, I am a fan of Zendesk’s clean layout – it condenses some of the separate dashboard views available from Freshdesk’s header toolbar onto one page. Switching between the Social, Solutions, Forums and Reports dashboards in Freshdesk requires a few extra clicks than in Zendesk, which assembles the features as icons on the Home dashboard and which can be accessed with a mouse scroll. Also, switching between dashboard views and modules seemed to work slightly faster in Zendesk. On the other hand, Freshdesk has at least one built-in keyboard shortcut that I use often – pressing Ctrl + Enter to submit ticket data. Zendesk does not allow this, at least not out of the box. Also, Freshdesk has a slightly more welcoming layout – its ticket entries are broader, its toolbar position is familiar; along with its native gamification features (more on that later), Freshdesk creates an open, friendly environment with social media-like aspects. I can see the appeal of both, and the UI is always a matter of preference, but I appreciate the polished look of Zendesk (and it’s fairly welcoming in its own right). I think high-volume ticketing centers would prefer the tight, organized look of Zendesk as well. Therefore, for user interface, I give the edge to Zendesk. Zendesk tickets allow users to toggle between a public reply and an internal note within the same window and without changing the text. (The window color changes to alert the user which mode they’re in.) Users can switch between the requester organization, profile and ticket without a major refresh of the screen. The Freshdesk ticket view occupies more of the page, oriented to the left, with the right side displaying ticket status, due date, requester info, and ticket properties, which are alterable through drop down menus. Users can also select the ticket source, also through a drop down menu, which is an option that doesn’t exist in Zendesk. Freshdesk offers six ticket statuses, as opposed to Zendesk’s three – whether or not you need that level of specificity is up to you. Freshdesk also has a built-in module for tracking time spent on tickets, as well as a to-do list visible to all agents. Verdict: A lot of the essential ticketing features exist on both platforms. Their pre-defined response automations go by different names but perform the same functions. I think the differences come down largely to your UI preferences and use-case scenarios. As mentioned I like the Zendesk UI. It has slightly faster page load times and its adjacent tabs of requester organization, profile and specific ticket allows switching between related information without a screen refresh. Freshdesk has the same information on the page but it requires a bit more searching. On the other hand, Freshdesk allows the keyboard shortcut Ctrl + Enter for sending messages, which has a small chance of sending an unfinished message but improves the flow of communication. I like that users can manually alter ticket properties in the same panel, particularly the ticket status – in Zendesk, ticket status is only alterable when you submit a reply. Freshdesk expands a different window depending on your decision to Reply, Forward, or Add Note; Zendesk switches between public and internal messages based on a tab – and while the text window’s color change should notify users which function they’re using, I think this still increases the potential for a misplaced. Finally, Freshdesk lets you CC/BCC relevant parties within the response window – which is intuitive – while Zendesk’s CC field is on the same panel where you can change ticket properties (but not ticket status). So although I like the general Zendesk aesthetic, I think the out-of-the-box arrangement of ticket features goes to Freshdesk. However, Zendesk leaves a space to the right of their ticket view that can be occupied by an app from the Zendesk marketplace. (At present, Zendesk has far more apps than Freshdesk.) Therefore, if you intend to integrate your CRM with your helpdesk software, Zendesk can allow CRM information displayed directly alongside the ticket. Or you can place a time-tracking module, which is free to download (and which Freshdesk includes out-of-the-box.) In general, I think this space for an integrated app of your selection is a strong mark in Zendesk’s favor. Overall, for ticketing features, I give the out-of-the-box edge to Freshdesk. Its layout feels far much more intuitive than Zendesk. But if you favor adaptability to a diverse range of specific use-case scenarios, and you’re confident your agents will navigate Zendesk’s layout just fine (it’s definitely not hard) then Zendesk offers a lot. Zendesk and Freshdesk both offer five tiers of pricing. All prices listed are billed annually; month-to-month pricing is available and is slightly more expensive. 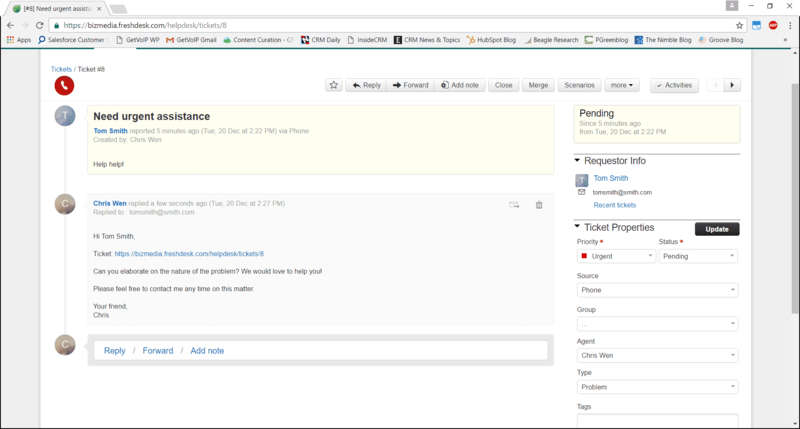 This provides ticketing functionality and a unified inbox for email and social media. Users can build their knowledge base – a searchable library of customer support articles. 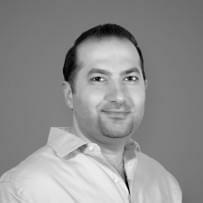 The web widget enables on-page support and the mobile SDK enables customer support via mobile. The customer portal allows customers to check the status of their support requests and follow certain content. 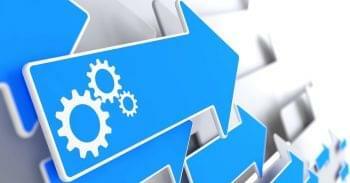 Business rules are configurable processes with specified triggers that produce certain results. Performance dashboards show metrics on support service within the helpdesk as a whole, individual agents, customer satisfaction, and so on. Multilingual support includes over 40 languages for customer-facing content, such as email notifications and webpages. Customer satisfaction surveys can be curated for specific types of customers and yield actionable data. Custom reports and dashboards allow more modifiable use of Zendesk with granular reports according to user specifications. Custom agent roles enables differentiation of users based on varying permissions (allowing, for example, a spectator view granted to a specific client). Multibrand support allows for unified helpdesk support for multiple brands under one umbrella. The launch success program helps administrators optimize their platform from the outset while machine learning allows the helpdesk to adapt to regular usage. Light agents have limited permissions but can stay informed on ticket progress and reports while adding private comments. Everything else in the Elite plan adds high-level uptime, security and service features that prioritize your company’s use of the platform. Full details on the Zendesk helpdesk plans can be found here. If you’re looking for a free solution with a dedicated mobile app, check out our list of the 10 best options. The email support channel provides a unified inbox for customer email requests. The standard phone channel is an integrated phone line (users must purchase numbers and pay for phone rates) with which users can record incoming and outgoing calls, convert calls to tickets and forward calls to mobile phones. The knowledge base is a user-built searchable library of customer support articles. Facebook and Twitter integration allows responses to social media queries from within the helpdesk. The community forums allow community conversations which users can access from within the platform. (Admins can create forums by category and also make announcements and sticky posts.) Game mechanics implement a scoring system based on performance metrics which keeps support staff engaged and recognizes strong performers. The live chat channel enables direct user-customer interaction through the company website. Support for multiple products partitions support sections for each one. Multilingual support includes 33 languages for customer-facing content, such as email notifications and webpages. IP whitelisting allows helpdesk access to be restricted to approved domains – useful if Freshdesk is used internally or only with selected clients. The custom email servers allow companies to send and receive emails using Freshdesk entirely through their own servers. The advanced phone channel features include call monitoring, in-depth performance reporting, warm transfers and more. Full details on the Freshdesk helpdesk plans can be found here. Full details on Zendesk security can be found here. Full details on Freshdesk security can be found here. Verdict: For all intents and purposes, Zendesk and Freshdesk both provide essential data security, application security and adherence to regulatory compliance standards. In this author’s opinion, Zendesk is more forthcoming than Freshdesk on their respective websites about what features are available to ensure account security on behalf of their users. This may be because Zendesk appears to offer more options over more plans than Freshdesk does. Two-factor authentication is immediately available to all plans, as is whitelisting by domain and TLS encryption. Whether this pertains to your specific use-case scenario is for you to decide; however, if you are a healthcare provider or handle sensitive medical data, bear in mind Zendesk is HIPAA compliant while Freshdesk currently is not. Moreover, Zendesk provides PCI compliance for a specific ticket field for receiving credit card data, which Freshdesk does not. On the other hand, Freshdesk is ITIL compliant, which refers to a baseline, ‘best practices’ alignment between software services and business needs. Meanwhile, Zendesk describes itself as ‘ITIL inherent’, which is to say, their software is built with best practices in mind while affording the flexibility to integrate features not ascribed to ITIL – like social media. Regarding business functions like Service Level Agreements, both platforms have business rules and automations that enable levels of support tailored to specific customer needs. So for most things being equal, except where Zendesk offers more, I give the edge to Zendesk for security. The real comparison between Zendesk and Freshdesk’s reporting capabilities begins at the former’s Professional plan and the latter’s Estate plan. These plans provide the respective platforms’ complete reporting packages, both of which are available for trial use. 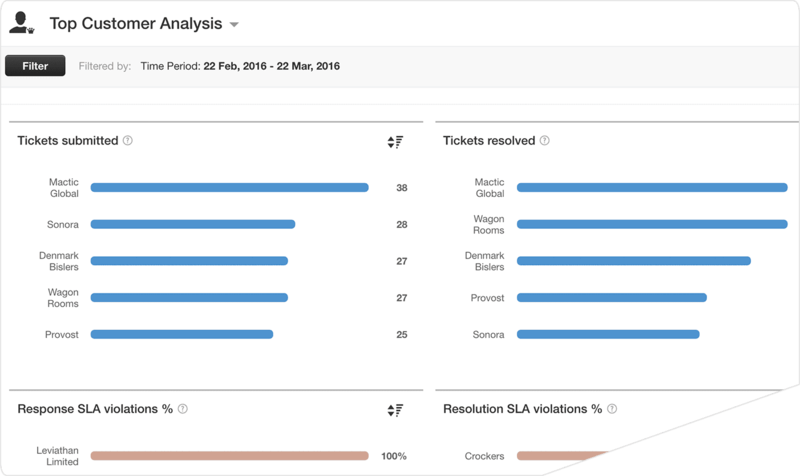 In all plans, Zendesk offers an Overview dashboard, which provides ticket stats – new tickets, solved tickets, backlog, agent touches, satisfaction rating, and average first reply time – as a line chart filterable by time period. It shows Tickets by Channels as a pie chart, Benchmark – which compares your helpdesk performance to global or industry averages – as a bar chart, Average First Reply Time as a bar chart, and Top Agents – by tickets solved, lead scoring, satisfaction or touches – as a leaderboard. Zendesk also has a separate dashboard for the agent leaderboard, filterable by time period with separate views for individual agents and groups. There is a reporting section for Talk – the integrated phone lines – that provides a look at current queue activity and an overview of highly specific data sets compared on a line chart with individual agent performances on a leaderboard. There’s a dashboard showing CSAT survey results with satisfaction ratings filterable by time period with feedback from individual customers filterable by satisfaction (good or bad) and with identifying markers such as assignee and ticket number. 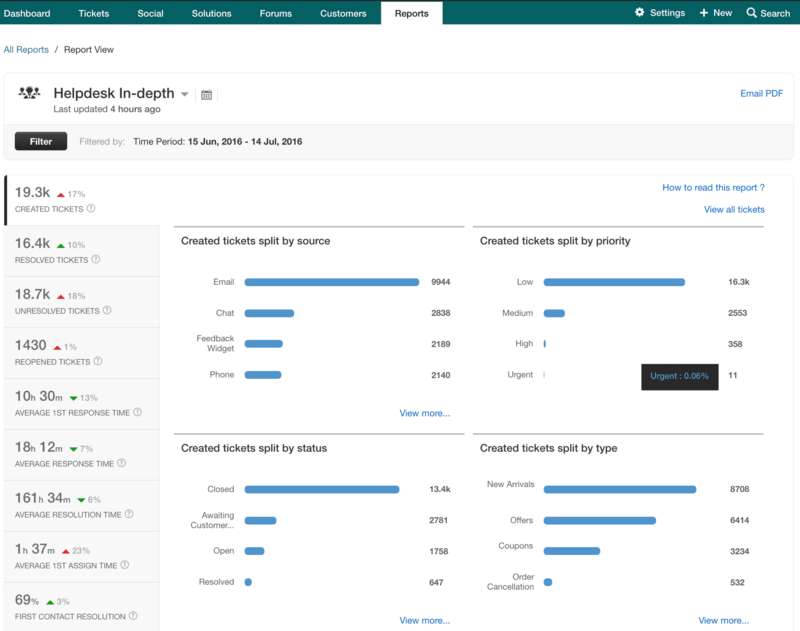 The meat and potatoes of Zendesk’s reporting features is their fifth dashboard, Insights, which is only available starting with the Professional plan. 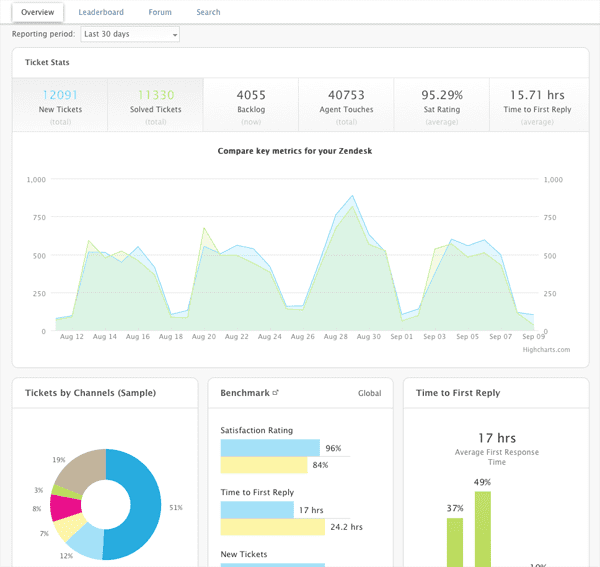 Insights provides highly granular reports in the same general categories as their normal dashboards and adds a few – Overview, Tickets, Satisfaction, Efficiency, Agent Activity, SLAs – and within each category, your specific helpdesk activity is visualized by filters such as ticket group, ticket source, organization, customer, brand, time period and other criteria depending on the context. This constitutes the pre-built analytics – Insights also allows customized dashboards, customized reports and customized visualization on any data brought into your helpdesk. All Freshdesk plans offer reports on Agent and Group performance. On separate dashboards,, Agent performance and Group performance both display – per individual agent or group – the number of tickets assigned, resolved, reopened, reassigned, and percentages for first response SLA, resolution SLA, and first call resolution. Note that most dashboards are filterable by time period, agent, group, customer, type, source, priority and product. Also note that all plans allow users to export reports as CSV files. The Blossom plan adds the ability to save reports and gives users access to the Helpdesk In-Depth dashboard. The In-Depth dashboard provides a detailed look at ticket stats and helpdesk performance per agent, group, or channel; the Garden plan – the next higher tier – provides granular ticket details within each report, such as source, priority and type. It also enables report scheduling. Both Blossom and Garden plans allow reports to be emailed as PDF files from the Helpdesk In-Depth dashboard. The Estate plan completes Freshdesk’s reporting capabilities with charts on Performance Distribution, Ticket Volume Trends and Top Customer Analysis. Performance Distribution shows first response time and average response time within intervals, a line chart showing their trends over the day, week, month, quarter and year, and average resolution time and trends. 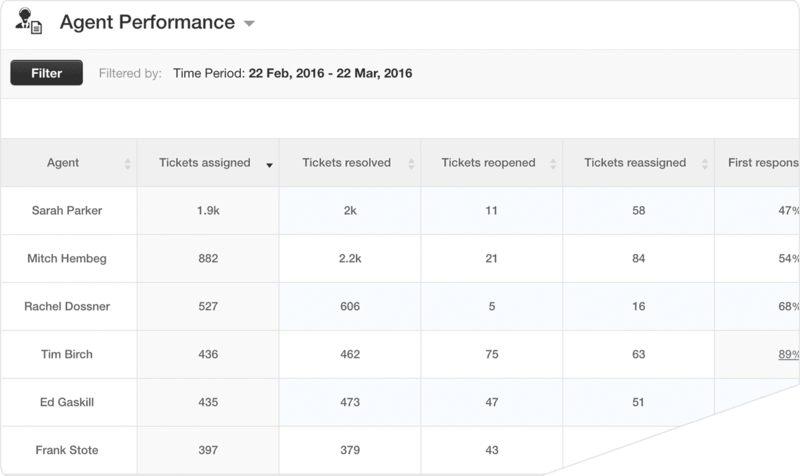 Ticket Volume Trends give a sense of helpdesk performance in terms of resolved and unresolved tickets per quantity received. There is a bar chart for load analysis over the same five time periods as above, as well as day-of-the-week and hour-of-the-day trends – that is, which specific days or times produced the most activity for ticket receipt or resolution. This information could help users tailor their helpdesk services to shorten resolution times for customer problems. Lastly, Top Customer Analysis gives insight on which customers are most important and which the most problematic in terms of tickets submitted, resolved, unresolved and reopened, percentages for SLA violation responses and resolutions, and numbers of responses from customers and agents. Users can toggle between the top and bottom 5 for each. Filters further enable users to pick out which customers produced the most high priority tickets, tickets of certain type, or tickets per product. Freshdesk doesn’t seem to offer users robust customization capability for curating reports. Admins are able to create new ticket fields for particular inflows of data, which can then be presented using the pre-built analytics, but at this point the reporting ends. Verdict: Freshdesk has fairly advanced reporting capability with a broad layout that’s easy on the eyes. 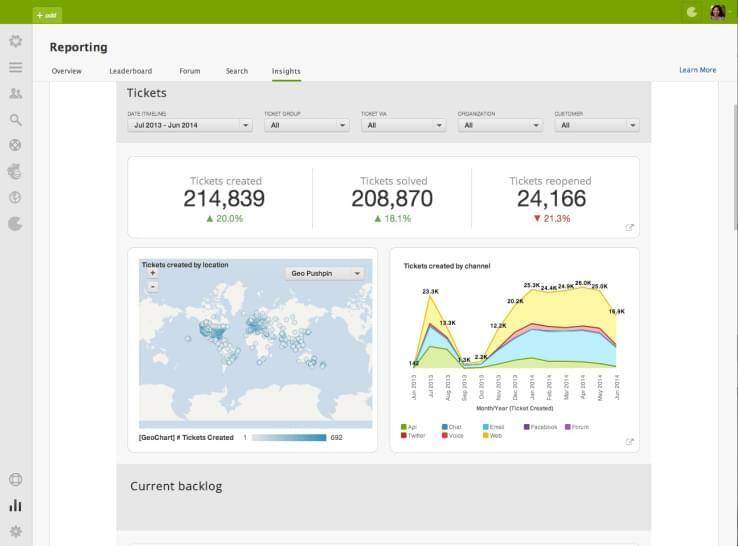 If your reporting needs don’t require high granularity or customization, and the pre-built analytics are sufficient, then Freshdesk offers a great deal of insight into helpdesk performance from individual agents to groups and by organization or ticket properties. The filters allow for a fair bit of closer looks. However, if your company wants the ability to produce highly specific reports according to custom criteria, not to mention detailed reports into phone support performance, or simply greater use of finer data points in general, there is really no question. The edge in reporting goes to Zendesk. Many verdicts of the featured subsections went to Zendesk, but a final verdict is not merely the sum of the subsections. As mentioned previously, much of the two platforms comes down to preference and need. In my opinion, Zendesk offers greater security and more robust reporting. But if you’re satisfied with Freshdesk’s security – and they’re hardly unsecure – and reporting capability, you don’t need to go the extra mile with Zendesk. And considering that Freshdesk comes in at a lower price point for comparative plans, any company considering a helpdesk platform must first evaluate their needs before choosing a provider. That being said, while the Freshdesk ticket format is probably more familiar to users – it resembles an email – and therefore more intuitive, I think the Zendesk UI is overall more usable. Zendesk also more tightly integrates social media channels, which any company with a serious online presence should care about. Zendesk also boasts over 500 custom and crucial CRM integrations to Freshdesk’s 96. As far as CRM integrations, both helpdesks offer several, some of which overlap. Zendesk and Freshdesk both offer Salesforce, SugarCRM, Zoho CRM, Microsoft Dynamics CRM, Capsule CRM and Infusionsoft. Other notable Zendesk CRM integrations include Agile CRM, Sugar CRM, SuiteCRM, BaseCRM, NetSuite and Magento. The only CRM integration Freshdesk has that Zendesk lacks is Insightly, which isn’t an official integration but rather makes use of the Insightly API and is available here. What Freshdesk has over Zendesk is its built in gamification features. The Freshdesk arcade, available with the Blossom plan, can attribute positive and negative point values to certain actions which allows users to level up and win awards and recognition. Users can also complete quests, which are business-specific goals such as resolving 10 tickets within a week or publishing 5 solution articles in the knowledge base. Admins can create new quests and adjust point values. Zendesk has add-ons which replicate these game features, but they don’t integrate as naturally as what Freshdesk includes with their platform. Ultimately a great many features overlap, and whereas Zendesk appeals to many with sheer functionality, a smooth UI and a small army of integrations, Freshdesk makes up for with its winsome style, intuitive ticketing and lower prices. Each platform comes with a 30-day free trial, and a prospective customer would do well to try both – to see if Zendesk’s functions and support are worth their price, and whether Freshdesk offers enough to meet their needs. Thousands of customers have gone either way. For helpdesk overviews, comparisons and user reviews, be sure to check out our Helpdesk Comparison Guide.